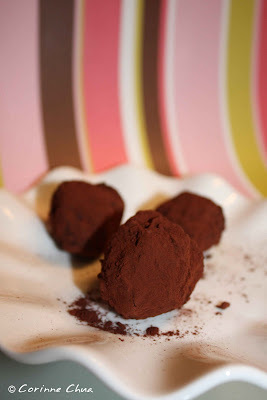 This is my first attempt at making chocolate truffles. I took a recipe from this book and started converting all the measurements from pounds and cups to grams. Something that I don't always do when I bake is "mise en place" which is a French phrase for "put in place" or "setup". I tend to measure only the basic ingredients that I require to do the first step in the instructions and as I go along, I measure the rest. This time round, I measured all my ingredients and prepared them before I embarked on making this. I think this is a good practice I should always remember. 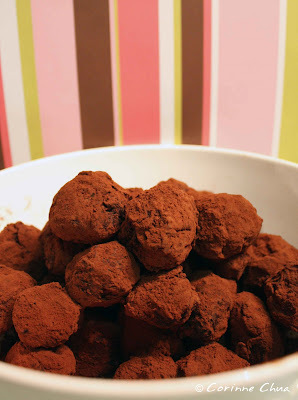 I read that desserts turn out best when the recipe steps are performed without interruption. these look yummy. i want one!